Other Products: A4 Gold Foiled card-stock, Yellow stickles, Bone folder, Scissors, Ruler, Hot glue gun, Versa-mark, Fussy Cutting Scissors, Gold Organza Ribbon, Misti stamping tool, Spectrum Noir Metallic Pencils: blue, Pink, Green, Rose Gold, Violet, Purple, Gold. Foam 3d squares or dots, Water mister. Instructions: The finished size of this card is 5.90in x 5.90in (15cm x 15cm). Taking the black card-stock cut to 12in x 5.90in (30cm x 15cm) Fold in half using the score-pal to form the tent fold card base. Taking the gold foiled card stock cut the first matting to 5.70in x 5.70in (14.5cm x 14.5cm). Taking again the black card-stock, cut the second matting to 5.51in x 5.51in (14cm x 14cm). Taking the Misti stamping tool, second matting card-stock and the versa-mark, stamp the Umbrella image in the left corner. Emboss with the gold embossing powder. Taking another sheet of black card-stock stamp again the umbrella image also the sentiment and the 14 flowers. Die cut the sentiment with the smallest eyelet heart die and a plain lager heart shape. Die cut the Umbrella and flowers. Taking a scrap piece of gold foiled card-stock and cut an eyelet heart a little larger than the plain heart. Adhere the heart layers together in a stack with the 3d foam dots. Taking the metallic pencils, color the flowers and the die cut umbrella. Adhere the umbrella with the 3d foam dots to the stamped image on the card front matting. 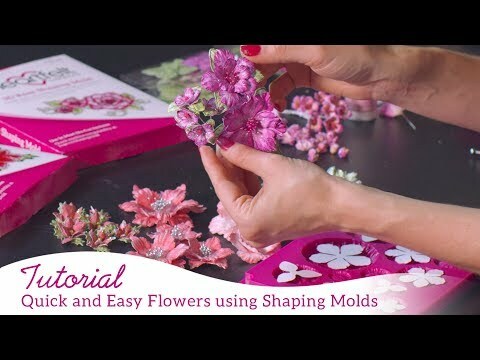 Taking the Lush Lilac Flower Shaping Mold, place the die cut flowers in the mold. Mist the flowers, place the mold top on then run it through the machine twice. 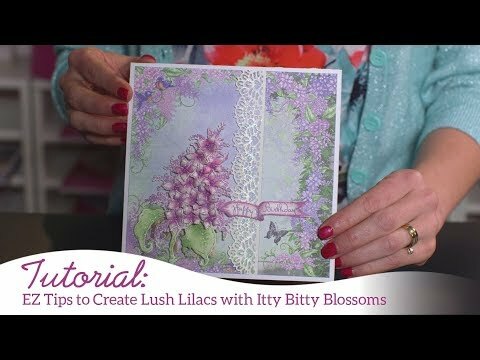 Adhere to the flower arrangement on the card front matting with the hot glue gun or the clear drying glue.